Tuesday went no further in settling the debate between EPL and MLS fans, but it provided some entertainment for a sparse home crowd and confidence for young Sounders players. The Seattle Sounders played a friendly against West Ham United of the English Premier League Tuesday night, the second of eight matches in July for Seattle. 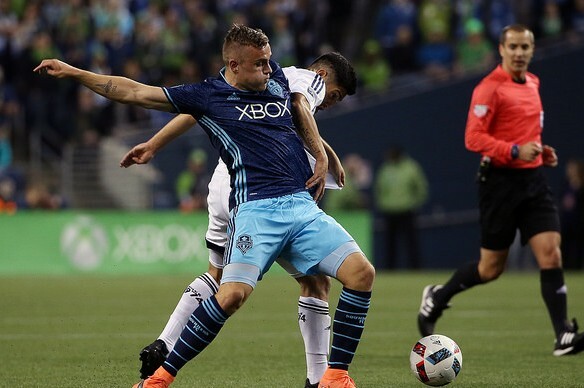 Both teams fielded young rosters as Seattle beat West Ham 3-0 thanks to two goals from Jordan Morris. The friendly was the classic midsummer meeting between an MLS team and a European competitor, sluggish and filled with reserves, in front of a reported crowd of 38,585 at CenturyLink Field rich in no-shows. Both teams fielded backup-heavy squads stocked with academy and developmental players, though West Ham stars Andy Carroll, Mark Noble, and Spanish keeper Adrian made 45-minute contributions opposite Andreas Ivanschitz, Herculez Gomez and Morris. Seattle sought minutes for as many backup players as it could, trying to rest the legs of starters ahead of a crucial home match against the Los Angeles Galaxy Saturday (12 p.m., JOEtv). The summer friendly is the ultimate no-stakes contest, especially in the eternal debate of whether MLS sides can hold a candle to their English counterparts. If the English team prevails, Premier League fans say a victory is obvious proof of English superiority, while MLS supporters decry midweek fixtures in crowded schedules. If you ask an English supporter why his team lost, as West Ham did Tuesday, it will be because they fielded a squad of academy players, all out of form and shape halfway through the offseason. MLS fans will contend that it’s a sign the disparity between the leagues isn’t so great. Both sides pick whatever truth suits them, though facts cannot be ignored. The difference between the Premier League and MLS isn’t hard to sniff out. The English Premier League is the second-richest sporting league in the world (behind the NFL). West Ham United spent an estimated £69.5 million (about $90 million) on player wages last season, finishing seventh in the standings. Seattle is set to spend about $10.5 million on player wages this season. That’s not to say that the average English player isn’t overpaid, nor that the average MLS player isn’t underpaid, but the Premier League’s greater coffers and prestige enable it to attract and keep higher quality talent on the bench. Still, Seattle’s youngsters did manage to outplay West Ham’s academy players, using the advantage of conditioning and the full-size pitch to stretch out the Hammers and run into space behind the back line. Slaven Bilic, West Ham’s manager, gave particular plaudits to Morris and 20-year-old Oalex Anderson on the left wing for their role in harrying West Ham’s defenders. Bilic said that West Ham’s main goal for the friendly was to avoid injuring any players in the first week of preseason. The Sounders went up shortly before the break. Gomez had his feet taken out from under him by keeper Adrian, causing referee Chipalo Street to point to the spot. Gomez converted, rolling a ball on the right side as Adrian went the other way to give the hosts the lead. Morris appeared as a substitute in the 62nd minute, scoring eight minutes later when Oalex Anderson deflected a cross, forcing a save from backup keeper Raphael Spiegel. The rebound fell straight to Morris, who converted. Morris added his second two minutes later, when Joevin Jones dropped a ball behind West Ham’s backline, putting Morris through one-on-one with Spiegel. Morris cleanly finished into the right side of the net, finishing off Seattle’s first win over a Premier League team. Coach Sigi Schmid admitted the Sounders bested a West Ham team that was in the early phases of its preseason, but noted that Seattle managed to do so with a large core of younger players. “A lot of their players are missing, but on the same token, we rested a lot of guys, and we played a lot of young guys,” Schmid said. “It was good experience for them. We scored good goals. Tuesday’s contest won’t shed light on whether the MLS can compete with the prowess and pocketbooks of English teams, but it gave both managers a good look at their depth, the home fans a pair of good goals, and, possibly, the Sounders more confidence as they try to turn around their league fortunes.